Carla Garro fits pieces of jewel-like sea glass together to create her one-of-a-kind heart pendants. Adrift at sea—tumbled by waves through salt and sand—colorful shards of glass become smooth, jewel-like treasures. Carla Garro finds them, and with her unerring eye, fits them together like puzzles to fill her shimmering silver heart pendants. 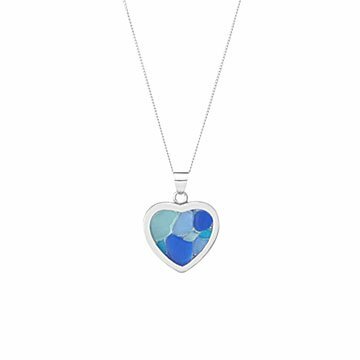 Each heart is expertly arranged to include an assortment of sea glass pieces in shades that mimic the colors of the ocean. Because the different shapes of the "jewels" make each pendant different from the next, every little mosaic she creates is a one-of-a-kind, wearable piece of art. Handmade in Massachusetts. Pendant: .7/8" L x 1" W Chain: 18"
i lovelovelove all things hearts & beaches ~ sea glass is rather rare, so this caught my eye. quality silver. sea glass fits together well. chain is ok quality ~ will probably replace it but very pleased & would purchase for a gift!! !